This is an original site that I created in the fall of 2000 to help the beginner and novice in guppy keeping. As you probably already know, raising guppies is an enticing, addictive hobby - guppies are popular and with good reason - they are beautiful and reproduce easily every 4 weeks or so! It's important to start off right, and hopefully I can help you do just that. I personally wrote all the articles you see on this site, however I have many people to thank who helped out when it all started for me! The articles are a combination of my own experiences and invaluable information from others, notably from the Yahoo club Uniquaria, the IFGA message board from years past, authors (check the Book Reviews page) and various websites, many of which have links here. Add this site to your favourites in case you need to refer back for more information! 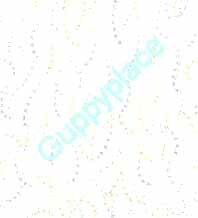 In addition to the articles, all photos and drawings on Guppyplace are also my work, and may not be reproduced without permission except for personal use. All photographs are pictures of my own fish. I do not personally answer questions about visitor's guppies, but do have a guppy club (link on homepage) that has many other enthusiasts available to help you out (if you can't find the answers here!). Thank you for visiting, and I hope you find the information here helpful!